This is a very exciting time of year. My husband and I try to eat seasonally as much as possible, sourcing many of the ingredients we use from local growers and purveyors who use sustainable methods for what they produce. We’re fortunate, living in the South (the Southern U.S., that is), to have a variety of vegetables available to us all winter long. The Cherokee Indians, who lived in this area, had a name for the time around February that meant “Hungry Month,” but with the number of family farms that now serve the Atlanta area year-round, we do not go without in winter. Collard greens, sweet potatoes, kale, carrots, turnips, winter squash, potatoes, green onions, radishes, apples, and more are all available. Unlike most of the rest of the country, we even get salad greens in all months except July and August. (Once you’ve tasted fresh, local salad greens, no other greens can taste quite as good. You can see, when you bite into fresh greens, why the farmers have to fend the deer off from them so mightily.) And we can get citrus fruit from Central Florida, traveling to us at a distance of less than 500 miles. When I want fruit in winter, I’ll take it. Of course, every year around this time, I look up one day and realize that Atlanta has burst, again, from the stark beauty of winter’s spread, brown, branches into a cacophony of colors and scents. Visit Atlanta late March to late April, and you’ll be scouring the real estate ads as you sip your sweet tea on a restaurant’s patio. The jonquils and dogwoods may kick things off a bit quietly, but the azaleas soon burst forth, nearly all together, within a couple of weeks. Then the maples and the cherry trees and the—just everything. Everything blooms, all at once. That’s how it rolls in Atlanta. The bees hum along from bush to bush, and the chattering mockingbirds build nests close enough to the porch to chirp warnings at you when you need to come inside or go out. If you can help loving Atlanta in the spring, may God help you—you’ve got a stone in place of your soul. Then the glorious inevitable happens. My weekly update from the CSA arrives, and as I skim the news, I see, “We have strawberries coming in this week.” And I jump up and down and call or email my husband to tell him. Strawberries again! We haven’t had a strawberry since last July. And while some might call us foolish for not buying the Chilean berries we could buy at the store all winter, we’ll take the real thing, thanks—local, and fresh off the vine to our plates. How else could I get so excited over the arrival of a fruit? The strawberries will be in season through perhaps June. Peaches, with their heady scent, will show up in May or June. The watermelon and canteloupe will become available in June, too, just as we need fruits full of water to quench our Southern summer thirst. The blueberries, blackberries, and raspberries will come into season mid-summer and may last through August. And the plums will round out the season. And those are just the fruits—just some of the fruits. The available vegetables will be too numerous to list. I didn’t always know which fruits and vegetables came into season when. A few years ago, despite growing up here, I was nearly entirely oblivious to what did or did not grow in Georgia, as well as when those foods were in season. Then, keeping only price and recipes in mind, I bought whatever I wanted at the grocery store whenever I wanted to eat it. But after I had cancer and started researching diet and sustainability and just how interconnected we all are, as we’ve adopted a diet based more around local foods, I’ve come to know what the CSA and farmer’s markets will start offering around what times of the year. And I’ve embraced the joy of getting fresh foods, at the peak of their nutrients, while developing relationships with some of the local farmers. It’s a joyful relationship, a satisfying practice. And this season of abundance starts with the strawberries. I’ve been daydreaming since last week about what to do with my two pints of strawberries when they arrive this Thursday, but I haven’t yet come to any conclusions yet. The strawberries are likely to be a bit less succulently sweet and juicy than they will be later in the season. Dan and I are avoiding cane sugar right now, though we are using some other natural sweeteners. . . . Do you have a favorite way of eating strawberries? A favorite recipe to share? I miss Atlanta in the spring…… but the first crocuses and violets are coming up here. Later, tulips and roses and lilac will burst open in April. Those flowers never flourished in Atlanta. I love the localness of flowers. Most of all, I miss the Bradford pears….. and the dogwoods, of course (but most of all the pears)…. and the cherry trees. There’s such an exaltation in an Atlanta spring. This post makes me miss Atlanta! I’m a sucker for Dogwoods and Azaleas, which don’t appear to flourish in Northern California. But it is getting so green here. 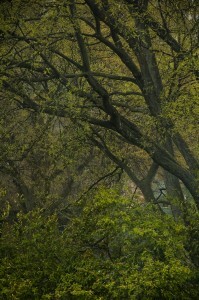 I love the freshness of early spring green and seem be startled by it’s beauty every year. Enjoy your strawberries. I got my first taste a couple of weeks ago — they were worth the wait. I had strawberry shortcake (GF and vegan) with a whipped coconut topping (agave sweentened). YUMMY! man, even in Virginia we don’t get strawberries until late May at the earliest. In Ohio it wasn’t until well into June. I love fresh strawberries–can’t wait for them to arrive here, too. I just wash and pop them in my mouth! I admire your patience in waiting for seasonal produce to hit the stands. I am not that patient! But I can see how one’s appreciation of local, seasonal produce would be heightened by the anticipation/deprivation of it during other seasons. Mm, strawberries. Out here in Colorado we’re still subsisting on canned fruit and jams from last summer, plus grains, beans and the like. But I was beyond thrilled to discover two pea shoots and some teeny spinach sprouts in the garden over the weekend… and I can’t wait to hear from the CSA that the asparagus is available for picking! Enjoy those berries a little extra for those of us not in the fruitful South!! I don’t know if you can have balsamic vinegar, but I find a a sprinkling of balsamic vinegar on the berries is delicious. Call me simple, but to me, a perfectly ripe strawberry on its own is something I just love and if I had two pints of them, I’d probably eat them as is, savoring every bite! An Atlanta spring is the finest experience. Last year I was in South America and while I was at the pool in January enjoying their summer I missed my Atlanta spring and this year I am rolling in it! I need to contact you “offline” to find out more about CSA. I’ve not looked into it because I am just me alone and do not go through much produce by myself but I think it is time now. As for strawberries, can use use a light drizzle of honey? I usually use a bit of sweetener (sugar or honey) on sliced berries and let it sit while we are finishing fixing the meal. Then after we eat, the berries are all juicy and sweetened. I want to try the balsamic vinegar on strawberries sometime. I love strawberry shortcake. It’s great that you’re supporting local food! My family eats them sliced up in a bowl with just a little sugar depending on how sweet they are. We buy ours at Sam’s Club which seems to actually have really good produce at a good price. I also like adding stawberries to my chocolate/banana whey protein shakes – gives it a nice little flavor bump. I was actually surprised by how little it looked like spring in Atlanta last weekend. The drought has definitely taken its toll. It looks more like spring in Lexington right now. I know what you mean though. I arrived home to all the “popcorn trees” blooming when only days before they had been bare. It is the time of year when bushes and trees seem to bloom over night. It makes waking up each morning so fun. Beck–You got here in the midst of flood-causing rain that knocked the blooms off the trees. It was stunning here before those days of rain. Ahhhh….that makes sense! That rain was so crazy on Saturday that I was driving around 285 completely freaked out and thought about going back to Snellville. I got an hour outside the city and it was completely calm. My favorite place is straight from the garden. I can pick them from June through October. Hard to believe isn’t it? The farm I go to plants different varieties. I’d never heard that until last summer. They’re organic too! Cool that you eat with the seasons and you have a bountiful harvest. Thought of you today when I was washing a bunch of strawberries and slicing them for fruit salad (green and red seedless grapes, kiwi and a little melon). My son loves strawberries and will have a nice treat today after school. Hope you’re okay. Missed reading your poses this month. Just wanted you to know we’re still out here thinking of you.